28-059 is on the 124. 37-036 was on the 103 with a lot of graffiti all over the rear of the bus. MR buses 25-237, 26-046, and 27-017 were on the 106, 36, and 211 respectively. I took 26-046, which was an accessibility violation and the two seats directly behind the rear door had their bottoms upholstered with the blue material from 24-307 and below. Also on the 106 was FR 31-152, while their 26-044 was on the 113. 25-210 was on the 35. 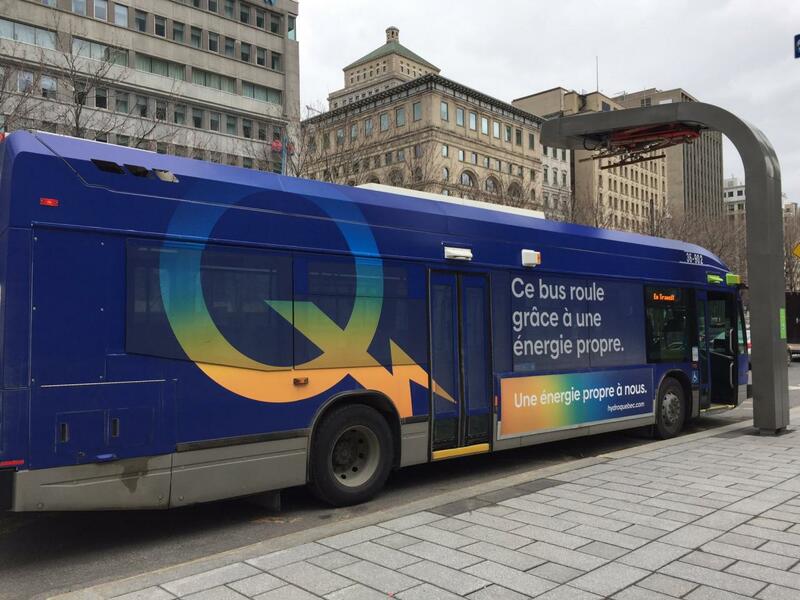 36-903 on the 36 has a full wrap for Hydro Quebec. It's blue and says something along the lines of "ce bus roule à l'énergie renouvelable" or something like that. I caught 32-009 on the 16 today, it has tiny rear numbers, the iBus screen and announcements are not working, and is missing the upper part of a folding seat. And they haven't cleaned the interior for ages, it's full of dust. 24-227 is also on the 16. 30-015 is on the 128. There were no cancellations on the 90-W today, probably for the first time since January. Still two eastbound departures though, 7:36 and 7:52 from Elmhurst, but they're both trippers so it's understandable. • 26-031 was on the 136 in the evening. • I saw AN's 27-009 on the 104 at around 21:20. • MR's 26-059 was on the 37 this morning. I later saw it on the 90-W at Vendôme around 17:45. • AN's 29-007 left Angrignon as the 110 this evening at around 17:25. • I took 37-059 on the 105 at about 17:40 with reflective stickers on the rear. It is not tracking on the realtime tracker. At the corner of Riverdale and Riviera (213 stop) there was a five alarm fire tonight causing Rue Riverdale from Des Sources to Rue Celtis to be closed. On scene were 30-251 and 38-028 who served the purpose of evacuating people. 30-251 has the Frontenac stickers on the rear top corners of the bus. Yesterday, the 810 had LaSalle's 29-078, Stinson buses 24-227 and 37-076 and St. Laurent's 28-101. 28-101 has motion sensing doors like 28-100. Mont Royal's 25-244 was on the 161 this morning. This run was actually done by Mont Royal according to the app. Mont Royal's 30-050 was on the 93 this morning. This bus has a second set of small black fleet numbers which makes me think this bus had a rear wrap before. 24-228 was also on the 161 this morning with the 2001/2002 lights. 31-111 was on the 213 around 8:30 am. Later saw it on the 468 around 12. And then saw it again on the 208 around 8:30 pm. Did this bus go back to the garage after the 213? This morning I caught 37-035 on the 16, it's not trackable. In the afternoon, 28-101 is on the 17 and I caught 26-025 on the 16 with FR rear bumper. AN 30-145 was on the 217 this morning. From Felix's tracker, AN 30-143, 144, 150, and 162 were also on SL runs. I took SN 37-014 on the first 219-W of the afternoon. SN 31-090 was on the 485. Edit: 31-806 has been reactivated on the 165. LaSalle's 32-031 was on the 215. Stinson's 37-014 was on the 174. Stinson's 24-223 is on the 170. LaSalle's 26-012 and 28-008 are on the 196 and 216 respectively. 30-174 is on the 174. Anjou's 30-143 is on the 225. 37-038 was on the 205. 36-902 also carries a Hydro-Québec wrap. do you have any other pictures of this bus ? Anjou's 30-147 was on the 72 this morning. Later in the evening I saw 30-147 on the 171. LaSalle's 28-058 was on the 171. 32-005 was on the 16 midday, running as a renfort. The bus that was supposed to do its departure was 37-037 on run 16-01, and it is now tracking properly on the 93 (still the same run) so I don't know what happened. 26-043 was on the 124 @ around 11:30 am. Anjou's 30-150 makes a return on SL territory. I saw it on the 171 W this morning. 37-049 is on Cote-vertu doing the 213 E even though today is the holiday schedule. Yeah I'm not sure how the STM decides which weekday only routes operate on which holidays. Routes like the 496-E were running at almost their full rush hour frequency this morning. Also, the 419 isn't running today but will be on Monday. I saw an unknown artic being towed on the ramp from A-20W to A-13N. I wonder where it was being towed from and where it was being towed to. Can CT SL perform maintenance on artics?